It's a very big work in progress at the moment and my guess is that it will take me months to complete it... and again, it's nice to work on something that doesn't involve paper or glue. :))) I love quilts, but I wanted to make something a little more artsy-fun-young..... and not your typical grandmas quilt. That's when I had the fantastic idea of making an Inside-Out/Art-Quilt. (okay, so I don't even know if that's a real term for a quilt, but I like it!!) 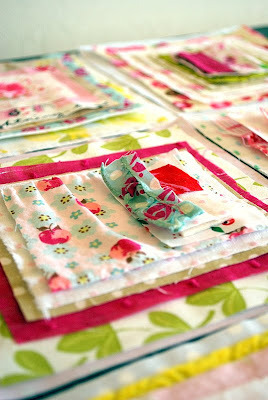 Lot's of crazy sewing lines, seams showing and mis-matched frayed fabrics, try saying that 3 times fast, and I wanted each square to look a little like my scrapbook pages that I've made. 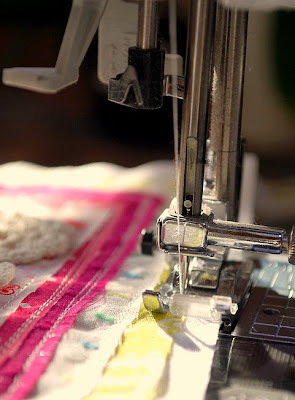 I'm using mostly repurposed fabrics, some of Alaina's old clothing, and vintage linens I've collected over the years. 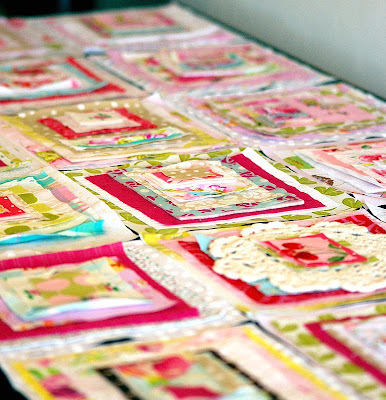 It's probably the perfect project for me, as I'm a bit of a hoarder when it comes to pretty fabrics. Just can't help myself! I still haven't decided on a size yet, but to date, I have 36 squares completed. Each square is 6x6 inches and has about 8-10 layers of fabric. I thinks it's just the right project to keep me creatively challenged for awhile!! I've been a bit under the weather lately, so I haven't really made any more progress with it, but as soon as I start to feel better, I'll keep updating with new photos! 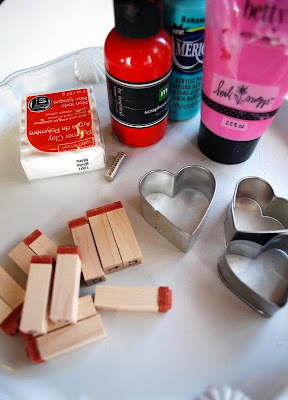 For my Bad Girls Blog project this month, I wanted to take a break from paper and use some of my favorite crafty products. 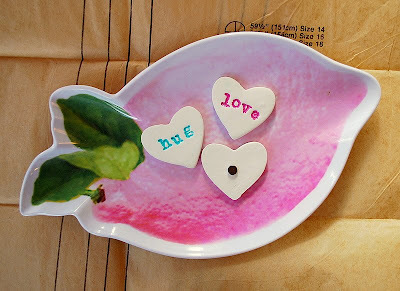 Paint + Clay + Cookie Cutters = cuteness! 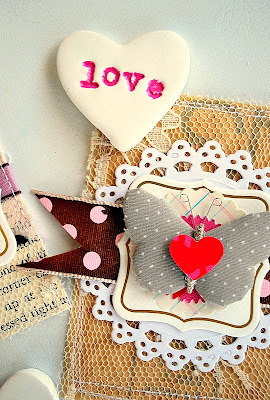 I thought about lots of Valentines Day themed projects, but making magnets to hang some of our favorite Valentines Day cards on the fridge would be fun! 1. Roll out clay to about a 1/4 inch thick. 2. Use cookie cutters to cut out shapes in the clay, and transfer to a covered baking sheet. 3. 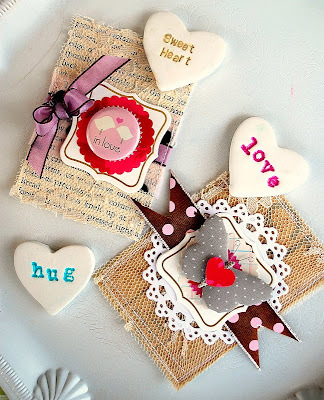 Use the stamps to create words on the clay hearts. 4. Bake clay according to package directions. 5. 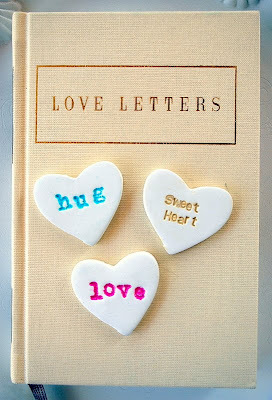 After the clay hearts cool enough to handle, add paint to the letters. Use a damp paper towel to remove any extra paint. 6. Once paint had dried, glue on a magnet to the back of each heart. 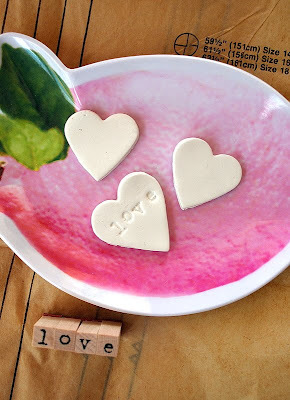 Alaina and I want to try using pink and red clay for our next set of heart magnets. It's the perfect rainy-day crafty project. Hope you enjoy the tutorial!! my computer is having some tech. difficulties at the moment!! I have no photos, so sad... I'm really hoping to pick up my computer from the repair place this weekend so I can get back to work! I want to share some of the photos of my newest creation, I started working on a quilt this month. It might just be my new hobby!! Happy weekend!